There’s no denying the fun that can be had at playing a prank on friends, and while that can be harmless enough when in private, it’s a little childish when taken to the streets and used on complete strangers. It seems as if the punked-and-pranked genre of television ought to be dead by now, but four New York guys prove that it isn't in "(Impractical) Jokers," a gleefully idiotic show that has its premiere Thursday night on TruTV. Since then the show has garnered more and more fans as time passes. Unfortunately I am not one of them. While the premise may seem simple enough and you may wonder how it is that anyone could dislike such a show, I in turn put the same question back to you, how could anyone like a show such as this? It's not the premise that bothers me, it's the people. Perhaps it's the cynicism in me, maybe I'm just a grump or a scrooge or maybe the show just isn't as funny as everyone claims. Allow me to say this though, I do appreciate what these four gentlemen are trying to do and I'm glad they've found an audience. I applaud anyone who's able to achieve success especially in a medium such as television where the emphasis on looks more often than not supersedes talent. Before I get too caught up in too much of a rant though, allow me to set up the show for those of you who aren't in "the know." Brian Quinn, James Murray, Joe Gatto and Sal Vulcano, who have a comedy troupe called the Tenderloins, go to public places in the New York region and give one another absurd challenges. A tally is kept of who succeeds and who doesn't, with the loser being subjected to an embarrassing punishment at the end of each show. The challenges in the opening episode include standing in Union Square to try to get signatures on nonsensical petitions, three of the guys watching via hidden cameras while the fourth approaches strangers. The gimmick is that the petition topics have been provided by the three onlookers, and the signature collector doesn't know what they are until he corners a potential signer and looks at his clipboard. So the collector has to try to keep a straight face as he asks someone to sign a petition that demands, "Enough with this rain already" or seeks an end to discrimination against men with small penises. The gag pays off twice: once in the reaction of the unsuspecting passer-by, once in the discomfort of the fellow doing the asking. The show sometimes sabotages itself by getting too crass; the funniest bits rely on incongruity rather than vulgarity. But even the crude stuff has a silver lining. Once in a while one of the four simply refuses to execute a challenge because it's in such bad taste. Although this results in a forfeit, and puts that person behind the rest. Season 1 is out now on DVD for those of you with a hankering for childish pranks and uncomfortable situations. Though this is a standard definition DVD, the show presents well enough. There's little to be offered here since we're not dealing with a high stakes action film, or a blockbuster sci-fi/fantasy epic. Essentially what you see is what you get but as I said above, those with a taste for this sort of show won't even notice. Audio wise is pretty much the same, no big bangs or gunfire to wash over you, just the childish giggles of four grown men laughing at the humiliation of their friends. Behind the Scenes – A look at how each prank is set up as well as what the guys like to do while waiting for their "scenes" to be shot. There's no denying the fun that can be had at playing a prank on friends, and while that can be harmless enough when in private, it's a little childish when taken to the streets and used on complete strangers. For me, the time of the practical joke show has come and gone, I prefer my humor a little better thought out than just telling a guy to go into Costco, pretend to be a cashier and make crude remarks to the customers. But perhaps that's what people need these days, a little less thought and a little more stupidity. Ah well, to each their own. 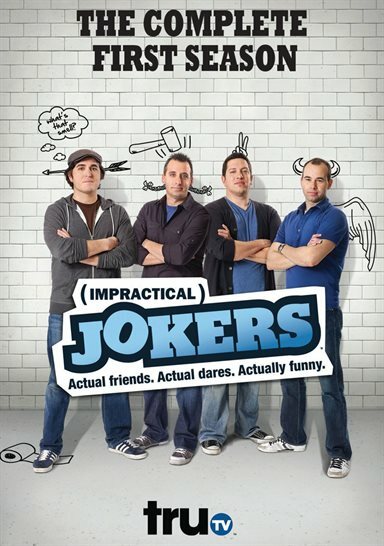 Download Impractical Jokers: Season One from the iTunes Store in Digial HD. For more information about Impractical Jokers visit the FlickDirect Movie Database.